It's such a sunny day and although I want nothing more than to run around outside... I have to stay in and work. So I decided that instead of taking a lunch break I was going to take a doodle break! 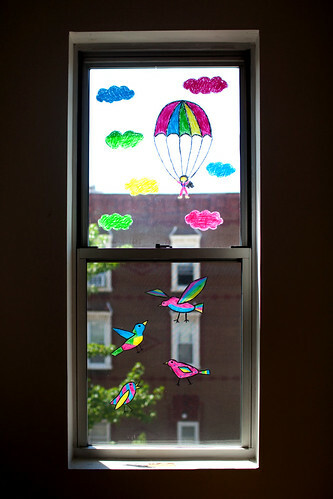 I used these fun window crayons to draw what I would like to see outside my window all day. 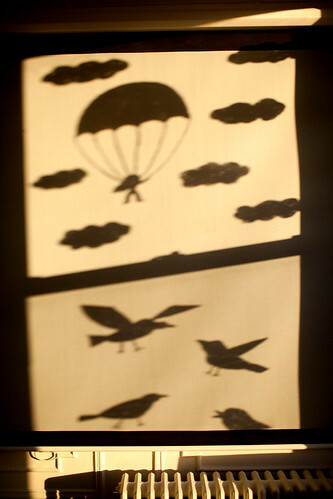 Now I can see birds and clouds and skydivers from right inside my living room. Working indoors just became way more entertaining. and they make such pretty shadows on the wall! So cute! Your little brother is the luckiest to have such a fun and creative older sis! I wish I had a window in my cube farm! This would be fun at home though. I bet my daughter would get a kick out of it! @ Marina- I'm definitely not good at drawing either. Just try doing some simple shapes! These are so cute, your blog is so inspirational, I absolutely love your work!! My monkeys would love to play with those- as would I.
I did not know those crayons existed! I'm definitely going to buy them when I find them! Soooo lovely! This is AWESOME! A fine way to be working inside indeed... the colors are just lovely. Where did you find these awesome crayons!? I love the images and color. I need to take more doodle breaks--thanks for the inspiration! Now I love you even more, Katie :D Maybe I should try this one day? It looks awesome! 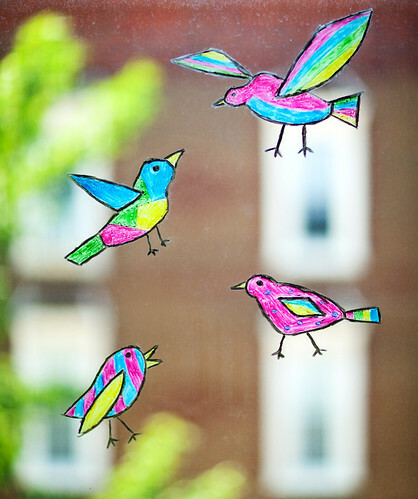 Cute almost-like-stained-glass birds, Katie! What sort of markers are those? The kind you can use to draw on the walls in the bath tub? I've been meaning to invest in a pair of those, it makes showers much more interestin'. do you remember when you were little, putting glue all over your pencil box, coloring it, peeling it off and sticking it to the window? It made a stained-glass thing like this too! Also, I wanted to share a fun discovery I made at the grocery store. I didn't get the idea from you but it reminded me of some of your street art so i linked it to you anyway. This is soo awesome, the shadows are the best part!!! I love them! AWE! Your window looks so much prettier now! And so does your wall, haha! that turns out to be so cool!me love it! My heart soars at the sight of this. i love these window markers! ouch! !that's super sweet!!! !i wish i have such a lovely window tooo! THANK YOU! the world needs a little more happiness. so magical! 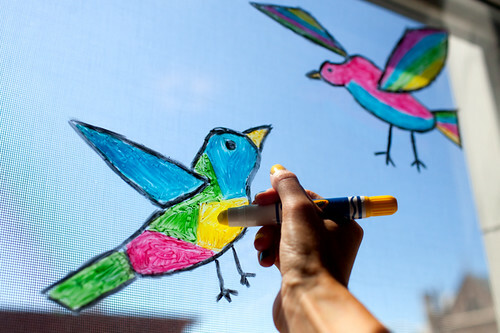 i have a humongous window on the front of my house... and two little squirrels who love to color... i think i'm going to have to get my hands on these. Window crayons? I didn't even know such things existed. But now I do and I've already gone and ordered my first set off the internet. Amazing! You and your wonderful ideas! Love it! whoo de shadows are so lovely! I LOVE WINDOW WRITERS. They are so much fun. In my apartment we have these HUGE windows onto our balcony and I love drawing all over them. They brighten up the whole place. look at this, full of colors - you are going to like it. Katie, I'm not a creative person at all, but I now find your blog the first thing I read everyday - well ahead of my boring, professional, business goof. Your pages are just so happy, vibrant and refreshing, you bring a smile to my face and make me wonder what I could do with my kids. Thankyou! pretty wonderful. thanks for sharing. it was already awesome enough... and then that sik shadow?.. ..very cool. Really cute! Love your blog Katie, always makeing me smile! Love your blog. I saw it this morning for the first time and I've been reading it til now. Greetings from Southern Spain, come back soon! omg! how fun! have a very happy 4th!! Awesome post. What a great Idea! oooh! I love birds! And I love the color of your nails! I tried to paint mine, but it wasn´t the same. How can I send you some pictures? You are inspiring, girl! SO SO glad I found your blog!! What fun and cheerful medicine for me:) I plan to make it a daily visit! What a creative idea! I love your drawing too. Is there anything that you can't do Katie? It seems like you're artistic within any medium! 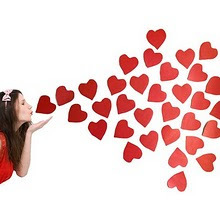 just love your blog! and this idea is great!! great idea! that turned out so well. You tell me what program you are using FOR ALL PICTURES, PLEASE! I ♥ this so much ! I had no idea such a thing existed! I'm moving real, real soon across the country and I am definately going to pick some up to cure my missing-my-mama-blues! Grande idéia - são coisas simples que dão um toque todo especial para nossas vidas! !